Members of the pro-life and pro-family community say they are overjoyed at the selection of Cardinal Jorge Bergoglio as the new Pope of the Roman Catholic Church. As LifeSiteNews reported in 2007, the new pope, Francis, has called abortion the “death penalty” for the unborn. He has also taken a strong stance in favor of the natural family in Argentina. He called gay marriage “a destructive pretension against the plan of God” and “a machination of the Father of Lies.” At the same time, in a story that is being much-repeated today, Pope Francis demonstrated his compassion when he visited a hospice on Holy Thursday where he kissed and washed the feet of 12 patients suffering from AIDS, a disease that is often associated with homosexuality. That legacy heartened pro-life and pro-family activists across the country. “I pray that Pope Francis I inspires, not only Catholics, but people of all faiths to promote and defend the culture of life,” New said. 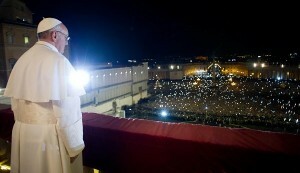 His choice of the name Francis – after St. Francis of Assissi – rang a hopeful chord in many of the faithful. Many hope that reform will begin with educational institutions run by his own Society of Jesus. As an Argentine Cardinal, the new pope sometimes clashed with political authorities – and sometimes his fellow priests, as one who distanced himself from those who taught liberation theology, a baptized Marxism dressed up in Christian terminology. Pope John Paul II strongly condemned its spread. The years he spent clashing with Argentine authorities will help combat the Obama administration and, perhaps, reform the sometimes inattentive U.S. Council of Catholic Bishops, according to Richard Viguerie, a practicing Catholic and the proprietor of ConservativeHQ.com. Those principles include an unqualified support of life from conception to natural death, causes for which the Vatican has become the world’s leading advocate. The media have made much that the pope hails from Latin America. Bergoglio, who is of Italian descent, has become a potent figure for the Global South and a reminder that papal leadership extends to every corner of the world. Others were simply impressed with the character of the man who has been chosen to lead the world’s one billion Roman Catholics. “It won’t be liberal; it won’t be conservative. It won’t be left-wing; it won’t be right-wing. It won’t be just Social Justice; it won’t be just doctrine. It won’t be just East or West,” he said. “This man lives what he believes,” he said. AUL’s Life List: Where Does Your State Rank?